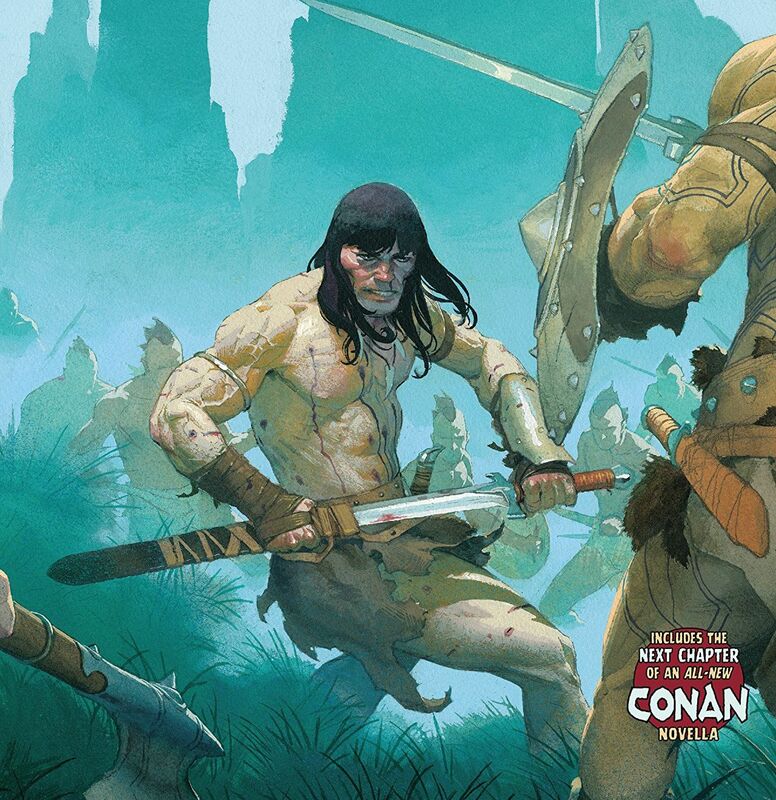 Conan the Barbarian #2 Review – AiPT! Conan is the hunter in this thought-provoking issue. Conan is back at Marvel Comics with two superstars at the helm: writer Jason Aaron and artist Mahmud Asrar. It’s a great time to be a comic fan, especially if you grew up reading the character. The second issue is out today and in it, Conan goes on a quest to kill people he hates, giant snakes, and…his prejudice? The the first issue knocked my socks off, proving Aaron has the chops to bring this character to new readers while also crafting a love letter for longtime fans. Asrar is at the top of his game and producing some incredibly beautiful full page spreads. Who is really being hunted? This issue opens scratching an itch fantasy fans are going to love. We get a map! It even uses a “bloody highlight” to show where Conan is in the story. This page also features a quote from The Nemedian Chronicles and puts Conan into a savage story fighting called Pict. It’s a story about hunters, the hunted, and how the worst animals are sometimes those that walk on two legs. Aaron peppers this with well-written captions that draw you into the journey Conan is on, which makes his lesson learned all the more impactful. Aaron is not shy about making Conan a bit of a racist. He kills the Pict people like they are inhuman, but this helps build up to the fact that Conan isn’t much different from these people. The comic serves as a lesson to us all and makes Conan’s story more than just a hack-and-slash tale, but a story with heart. It also does a great job fleshing out the world and the variety of people. Anyone reading this expecting a story that follows more closely with the cliffhanger of the last issue…rest easy. There’s something here for you too. Asrar and colorist Matthew Wilson are cooking with fire on this issue. Moody nighttime jungle scenes open the book and when the limbs literally fly you’ll be crying out with the intensity Conan brings to the battle. The use of shadow is quite impressive too, helping to convey we’re peering into a very special story. Shadows of branches border panels, or how the shadow over a character’s eyes can help convey sorrow add up to a reading experience that draws you in. Dialogue can be quite heavy in this issue. Some word bubbles practically take over panels, and it takes quite a lot of talking to get Conan up to speed after the opening action sequence. Thankfully there’s a deeper meaning that runs alongside all this setup, but it’s unfortunate it’s not paced out a bit better. Fans expecting a continuation of the last issue are going to be a bit peeved with this issue. Given the more episodic adventures Conan goes on, it makes a lot of sense to not carry the last issue’s story forward directly, but it does come as a shock. Thankfully there’s a callback to characters in the last issue, though. Conan the Barbarian is true to form. If you were worried we wouldn’t get done in one adventure stories, fear not, as this issue offers up a great one.